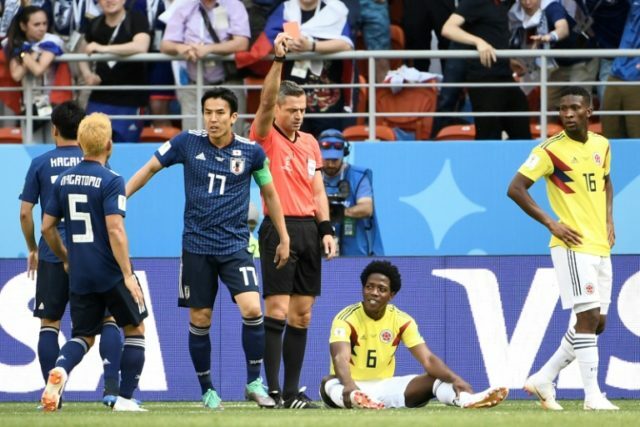 Kazan Arena (Russia) (AFP) – Colombia coach Jose Pekerman dedicated a crucial 3-0 World Cup win over Poland to midfielder Carlos Sanchez on Sunday after reports the midfielder received death threats for his red card against Japan. Sanchez was suspended for the game at Kazan Arena as Colombia got back in contention for a place in the last 16 and Poland were eliminated, and has had “a very hard time” dealing with the fallout from his third-minute sending-off in the 2-1 defeat to Japan, Pekerman said. The Espanyol midfielder will be eligible to return to Pekerman’s side for the make-or-break last Group H clash with Senegal on Thursday. Pekerman said he spoke for the whole squad when he dedicated Colombia’s victory to the 32-year-old player. It evoked memories of the chilling murder of former Colombia player Andres Escobar, who was killed after his own goal led to defeat to the United States in the 1994 World Cup and Colombia’s elimination from the tournament. In a match Colombia had to win to survive the group stages, the South Americans’ patience paid off with Yerry Mina breaking the deadlock in the 40th minute with a powerful header from a superbly-curled James Rodriguez cross that gave the big Barcelona defender his maiden World Cup goal. Colombia’s march to the quarter-finals in Brazil four years ago came thanks to Rodriguez’s six-goal tally for ‘Los Cafeteros’. And days after a calf injury restricted him to a half-hour cameo role against Japan, the Bayern Munich midfielder was back to his best in an ultra-offensive line-up that gave Radamel Falcao his long-awaited maiden World Cup goal and Juan Cuadrado Colombia’s third of the evening. Cuadrado teased and frustrated the Polish defence in a positive start to the second half, and after Colombia ‘keeper David Ospina bravely denied Robert Lewandowski when he latched on to a dangerous long ball, Colombia turned up the heat. When right-back Sanitago Arias found Juan Quintero, the midfielder sliced Poland’s defence apart with a low pass that found Falcao on the run before he coolly beat Wojciech Szczesny down low with the outside of his right boot. “I’m very sorry and very sad about the result, but tomorrow’s another day and we have to come to terms with things,” he said. “Our players did their best until the end of the game. We lost to a very strong team and this is something we have to accept.